Excellent historical fiction with some violence. When beggar Tom Canty and royal Edward Tudor discover that they look alike and switch clothes, the whole kingdom is affected. As Edward is locked out of the palace, Tom learns the hardships and pleasures of being prince. And while Tom is forced to fill in for him, Edward discovers the injustice and cruel difficulties of a peasant's life. While many minor characters are cruel, deceitful, and wicked, their deeds are marked as wrong. Meanwhile the selflessness and love of others is highly commended. Edward begins somewhat proud and spoiled, but he is deeply appreciative of others' sacrifices for him, and promises to right those who have been condemned unjustly. He grows to be a much gentler and humbler person, while keeping all of his integrity and morals. God's name is used freely without meaning. An old man claims to be an archangel, and a couple of characters appear to believe him. A woman Edward befriends is in prison for being a Baptist. Edward's own Christianity is not mentioned. Characters get beaten by Canty (Tom's father) and others. Various punishments and methods of execution are described, including being slowly boiled alive. Edward sees a woman burned at the stake for being a Baptist. A few characters are scourged. A minor character lives in fear of her dangerous husband. Various characters are threatened with execution. Both Tom and Edward are believed to be mad. A main character is nearly murdered. None of the violence is described at all, other than Edward and Tom's reactions to seeing or hearing about it. Some characters drink to excess. Wine is drunk by most of the characters. God's name is taken in vain throughout the book. Though the violence and vocabulary levels are rather higher than I would expect in a children's book, The Prince and the Pauper deserves a place on every family's shelf. The plot has many little twists and turns that keep it unpredictable. Despite the older English used, the story is easy to read as each sentence flows smoothly into the next. It is packed with historical tidbits, from laws against stealing to the process of dressing the prince. Many of the incidents resulting from the mix-up between the boys are very humorous, and the descriptions are delightful. While many readers wish more of the story was focused on Tom's adventures, I appreciated watching Edward's learning and the growth of his character. 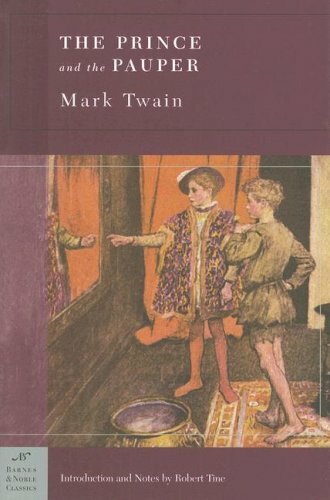 Overall, the only thing I didn't love about this book is that Twain gives Edward a different reason for his reforming and just rule than that of his faith. As it is so filled with history (Henry VIII, Edward Seymour, etc. ), The Prince and the Pauper would make a good launching point for a unit study. Recommended for high schoolers.